Anodized aluminum handwheels and other parts like the ones shown here can be produced quickly and accurately, and you deal with only one source instead of several. Other colors are available. 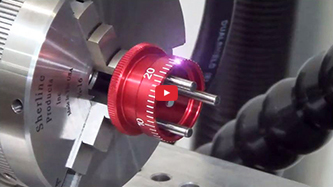 Sherline Products Inc. has the capability to produce custom, laser engraved parts for your product applications. Our CNC machining capability and in-house laser engraving equipment mean we can take your drawings and deliver finished, high quality parts to your specifications. Orders are subject to certain minimums, but, in most cases, quantities as low as 200 parts would be feasible to produce. By having Sherline produce your parts, you deal with just one vendor instead of two or three. 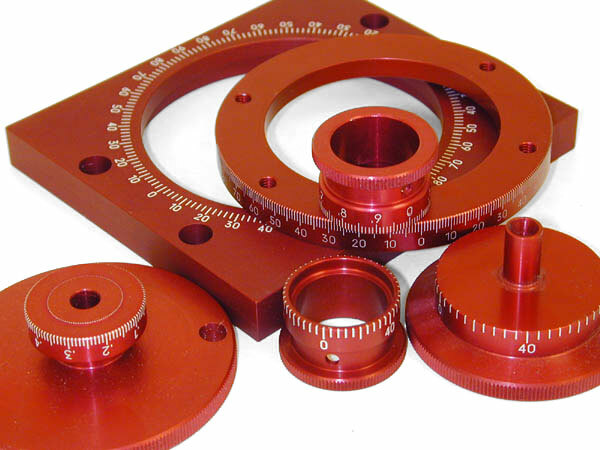 We handle the material purchasing, machining, the anodizing and the laser marking. With everything done by one contractor, the job is completed and back in your hands quickly. There is no need to track the part through several vendors and pay multiple shipping charges. *NOTE: Finishes can vary in appearance from lot to lot. We cannot guarantee a specific color match beyond the limitations of the process itself. Parts will be delivered with finishes to normal industry standards of acceptability. The photo on the left shows some of the variations in the red color we typically use. Sherline uses a YAG laser to burn through the colored coating on an aluminum part to expose the bright metal below. This has the effect of leaving a bright white line against a darker color. It looks like paint, but it can't be wiped off even if solvents are used. The divisions and numbers are sharp and accurate, and the part is not distorted as it can be with pressing or rolling operations. Colored anodizing offers many choices*, with black, red and blue being the most common, but other colors are also available. ("Clear" anodizing is not recommended as it does not offer any contrast with the metal below.) Steel parts can also be engraved, although the contrast and readability is not quite as good as on anodized aluminum parts. In addition to incremental markings, your address, logo, serial numbers, cautions or other information can also be applied. CLICK on the image above to view a YouTube video of the laser engraving process in action using Sherline 3-Jaw Chuck "Pin Jaws." 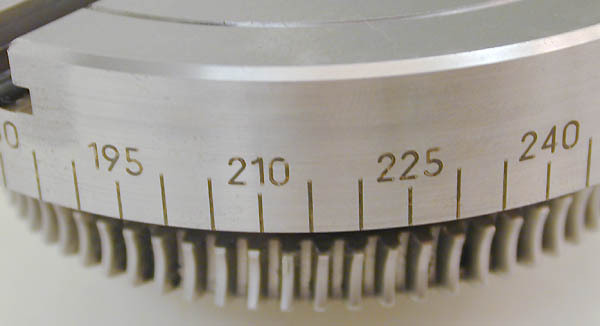 The most common applications include handwheels, dials or parts with scales. The first parts we made using this system were "Easy-read" dials for Bridgeport® milling machines. The standard Bridgeport handwheel dials are bare metal with the numbers rolled in. Our replacement dials have been very popular as upgrades on similar machines because the white numbers on a black background are easier to read. We also make all the handwheels and other marked components used on our own line of miniature machine tools. We can easily add your parts to our production schedule. Our prices are very competitive because we will not have to make any additional investment in overhead to produce your parts. Send us a drawing of your proposed part along with a projected one-time or periodic quantity. We will provide a quote for the materials, production, coating, marking and delivery of the product. You may fax or email your drawings to the attention of Karl Rohlin at 760.727.7857, or karl@sherline.com, respectively. Provide a phone number where you can be reached if there are any questions as well as the address to which the parts will be shipped. Our quote will include the material, machining, anodizing, marking, and delivery. If you have any questions about the feasibility of your proposed project or the capabilities of our equipment, call us at (800) 541-0735 or (760) 727-5857. The best time to call is Monday through Friday between 9 AM and 3 PM (Pacific).